IN DESIGNING POWER SUPPLIES for the 8180A Data Generator, 8181A Extender, and 8182A Data Analyzer, the most important objectives were high load current capability and serviceability within a restricted space. The sizes of the instrument cabinets were limited by the desire to produce a system suitable for benchtop operation. To accommodate the generator, the analyzer, and perhaps two extenders on a bench, the cabinet dimensions obviously had to be limited. The card rack in the generator holds eleven printed circuit boards with a spacing of 20 mm between boards. The analyzer has thirteen boards with 17-mra spacing. Because both cabinets also accommodate a CRT display, the space available for power supplies is severely restricted. The outer dimensions for the power supplies were fixed at 254 x 152 x 139 mm. The high load currents are required especially by the -5,2V rails. In the 8180A Data Generator, the current taken from the -5.2V supply by the Rate ICs alone is approximately 7.1 amperes. The total current demanded of the -5.2V supply is on the order of 18.5 amperes. Furthermore, the numerous output amplifier circuits each demand 5.5W from their +15V and -7.5V supplies. In the 8182A Data Analyzer, the complex ECL logic circuits have a total requirement of some 28 amperes on the -5,2V rail, making this supply the most heavily loaded in the system. 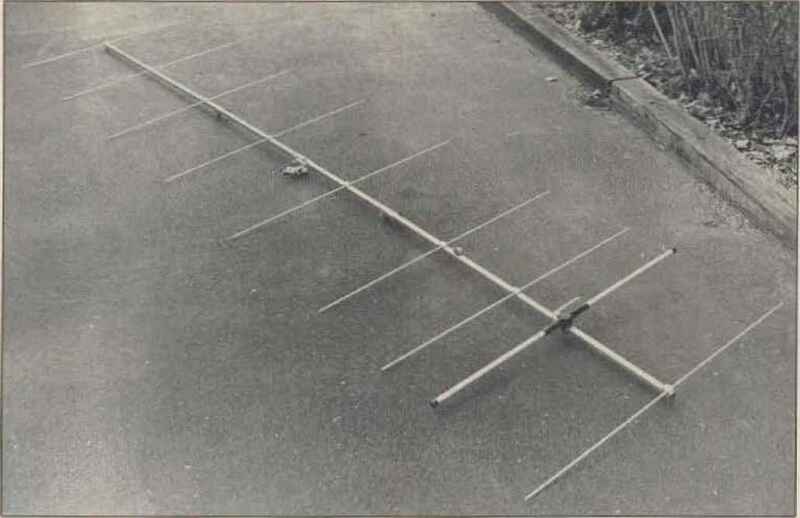 To aid production and serviceability, the decision was made at an early stage to produce modular supplies consisting of plug-in units and boards, and to make the three supplies as similar as possible, if not identical. It soon became evident that the demands made on the 8182A power supply were unusually heavy, and although the concept of switched-mode-with-flyback was adopted for all three instruments' supplies, fundamental differences exist in the 8182A supply. Fig. 1 illustrates all of the main functional blocks of the 8180A supply. After rectification (or doubling and rectification, in the case of a 115V ac input], the value of the potential at the switching transistor collector is between 200 and 360V, depending on the line voltage. Fig. 1, Functional clock diagram of the 8 7 BOA Data Generator power supply circuits in the supply draw their power from the flyback transformer. The normally closed relay contacts remain open, disconnecting the start circuit and conserving power while the instrument is operational. 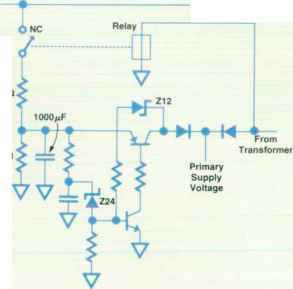 ■ Switching transistor drawing in excess of 12A. If the temperature inside the cabinet exceeds 75°C. 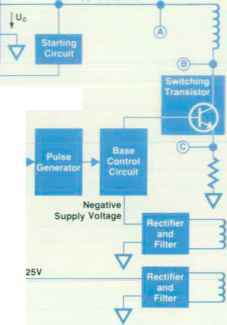 the switching circuit cuts back its output and supplies a minimum duty cycle. The fan in the power supply continues to run, and all output supplies are shut down. The peak voltage at the collector of the switching Iransis-tor is in the order of 1000V. It was therefore necessary to use a component with a very high V!BHJCEQand If;max. When the device is negatively biased in its cutoff range, it is possible to attain the 1000V col lector-emitter potential. However, during the start cycle, negative voltages are unavailable because of transformer output settling times. Therefore, potentially hazardous situations cannot occur because voltages greater than 700V are riol generated during the start cycle, and the transistor adequately handles everything below 700V without being negatively biased. Fig. 3. 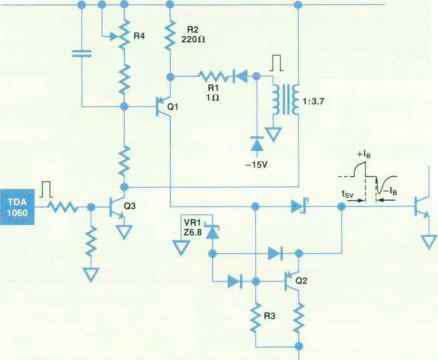 Switching transistor base control circuit. complished in two stages. In the first, the main component of the bias current at the base of the switching transistor is withdrawn by disabling Q3. The second stage deals with the delayed withdrawal of the lesser component The delay is achieved by the slow switch-off of Ql, governed by anRC network at the base. R4 allows fine adjustment of the delay time. The result of this delay is that Q2 is maintained in its cutoff state long enough to sink any stored current present at the base-collector junction of the swiiching transisior. A delay of 2 fis is normally adequate to minimize switching losses. When the switching transistor is finally turned off, its base potential falls to approximately -7.5V. The cycle is then repeated continuously for as long as the instrument is switched on. Asa starting point, a magnetic core that at the rated power consumption could guarantee an acceptable magnetic flux density of less than 220 mT was required. Another important design criterion was the stray inductance present in the windings, which causes losses in the primary side of the power supply. Furthermore, the triangle current waveforms generated in a flyback system cause a highrms current. This and the skin effect had to be taken into consideration when selecting a material for the windings. The transformer (see Fig. 4) consists of a U-shaped core with both legs carrying a bobbin, giving a double-wridth layer. This is of critical importance in dealing with stray inductances. The primary winding is constructed by connecting the windings of both bobbins in series. The secondary windings are sandwiched between two primary winding packages, each having an identical number of turns. All secondary windings are connected in parallel to help deal with high-density currents. These construction methods result in a symmetrical flyback transformer having a stray inductance of less than 3% of the primary inductance. Further problems concerning high current densities and skin effects were overcome by using multifilar windings of high-frequency stranded wire, each strand having a cross-sectional area of approximately 1.5 mm2. Special care in the production of the transformer is necessary because of the numerous bobbin-to-mounting-board connections. Finally, the transformer is encased in a silicone rubber compound. Fig, 4. Flyback transformer design reduces stray inductance to less than 3% of the primary inductance. The 8180A power supply is also used in the 8181A Extender. In each instrument the internal load varies according to the options supplied. Fine control of the output rails is achieved by postregulators. each of which has its over-current sensing circuit. A transformer sense coil in the primary winding preregu-lates all snpply rails. Preregulation is determined by the efficiency of the secondary voltage that takes the highest loading. In the case of the8180A, this is the -5.2V rail. If an overcurrent condition occurs at one of the outputs, the common reference voltage for all postregulators is shut off. In turn, all output rails decay to OV. Because short-duration overcurrents and capacitive loads are present from time to time, shutdown of the output rails is delayed by 70 ms. This, however, results in extra stress on the series transistors in a short-circuit situation. For this reason, if an overload does occur, the postregulators remain down for approximately two seconds, after which the reference voltage comes on again. A check is then made to see if the overload condition still exists, and if so, the reference voltage is again shut off. supply was implemented. This additional supply permits a saving of over 5A in the -5.2V supply. A more direct method, in which the duty cycle of the flyback transformer is controlled by an optocoupler, is used in the —5.2V supply. The transformer is designed to allow all rails other than —5.2V to be finely postregulated. as in the 8180A and 8181A. Again, all supplies are protected against short circuits, and if an overload occurs, the powrer supply is switched off on the primary side by a second optocoupler. The switch-on phase of the power supply came under close scrutiny. Limited space prevented the use of a line transformer to supply the secondary regulating circuits, so the start cycle is controlled as in the 8180A power supply, using a high-resistance divider for preregulation. As the secondary reference voltage rises, a low-resistance divider fed by the optocoupler is paralleled with the highresistance divider and takes over control. Circuitry for regulating the -5.2V' rail in the 8182A power supply is very different from that in the 8180A and 8181 A. The configuration here consists of a circuit with infinite gain and a very low cutoff frequency. The 100-to-120-Hz ripple cannot be regulated in this circuit, so it is inverted in a low-gain amplifier, then mixed with the -5.2V sense voltage in a unity-gain circuit. The output is then passed to the emitting diode of the optocoupler. The result is a —5.2V supply with a ripple content of less than 30 mV.